Birth. (No date found), Naples. Of an illustrious family. His father was Roberto Caraccioli. Relative of Cardinal Niccolò Caracciolo Moschino, O.P. (1378). His last name is also listed as Caracciolo. He was called the Cardinal of Mileto. Early life. Provost of the church of S. Stefano, Aquileia. Pontifical subdeacon. Episcopate. Elected archbishop of Nicosia, June 25, 1395; he had been provided on March 29, 1395; took possession on June 25, 1395. Consecrated (no information found). Vice-camerlengo of the Holy Roman Church, March 30, 1395. Abbot commendatario of the Benedictine monastery of Mosace, patriarchate of Aquileia, February 22, 1402. Transferred to the see of Mileto, October 2, 1402. Camerlengo of the Holy Roman Church from 1404 to 1406. Cardinalate. Created cardinal priest in the consistory of June 12, 1405 with the of S. Crisogono; retained the administration of his diocese until 1409 (1). Participated in the conclave of 1406, which elected Pope Gregory XII. Shortly after, he abandoned the Roman obedience for that of Pisa. Participated in the conclave of 1409, which elected Antipope Alexander V. The antipope named him legate a latere in Lombardy; he left Pisa on September 3, 1409. Named administrator of the see of Orvieto in 1409. He worked for the union of the church with the pseudocardinals created by Antipope Benedict XIII. Participated in the conclave of 1410, which elected Antipope John XXIII. Named locumtenens of the camerlengo of the Holy Roman Church, Enrico Minutoli, August 30, 1410, during the latter's absence. Death. February 15, 1411, Bologna (2). Buried in the cathedral of Bologna (3). Bibliography. Cardella, Lorenzo. Memorie storiche de' cardinali della Santa Romana Chiesa. Rome : Stamperia Pagliarini, 1793, III, 320-321; Chacón, Alfonso. Vitæ, et res gestæ Pontificvm Romanorum et S. R. E. Cardinalivm ab initio nascentis Ecclesiæ vsque ad Vrbanvm VIII. Pont. Max. 2 volumes. Romae : Typis Vaticanis, 1630, II, col. 718-719; "Essai de liste générale des cardinaux. VI. Les cardinaux du Grand Schisme (1378-1417)". Annuaire Pontifical Catholique 1931. Paris : Maison de la Bonne Presse, 1931, p. 139; Eubel, Conradus and Gulik, Guglielmus van. Hierarchia Catholica Medii Aevi. Volumen I (1198-1431). Münich : Sumptibus et Typis Librariae Regensbergianae, 1913; reprint, Padua : Il Messagero di S. Antonio, 1960, pp. 26, 40, 341 and 366; Orsoni, Alessandro. Cronologia storica dei vescovi Olivolensi detti dapoi Castellani e sucessivi patriarchi di Venezia. Corredata di annotazioni illustranti l'ecclesiastico-civile veneta storia. Venezia : Tip. G.S. Felice, 1828, p. 242; Weber, Christoph and Becker, Michael. Genealogien zur Papstgeschichte. 6 v. Stuttgart : Anton Hiersemann, 1999-2002. (Päpste und Papsttum, Bd. 29, 1-6), V, 139. (1) Orsoni, Cronologia storica dei vescovi Olivolensi detti dapoi Castellani e sucessivi patriarchi di Venezia, p. 242, says that he was promoted to the patriarchate of Grado very shortly before being created a cardinal and that he then resigned the patriarchate. None of the other sources consulted mention him as patriarch of Grado. (2) This is according to "Essai de liste générale des cardinaux. VI. Les cardinaux du Grand Schisme (1378-1417)". Annuaire Pontifical Catholique 1931, p. 139; and Eubel, Hierarchia Catholica Medii Aevi, pp. 26, 40 and 341; Chacón, Vitæ, et res gestæ Pontificvm Romanorum et S. R. E. Cardinalivm, II, col. 718, indicates that he died on February 25, 1411; his eptaph, in note 2, says that he died on XV Kal. Martii MCCCCXI. Birth. Ca. 1325 (or 1335), Venice. Of an ancient patrician family. Son of Niccoló di Pietro and Polissena (her last name is unknown). Uncle of Cardinal Antonio Correr, C.R.S.A. (1408). He was called the Cardinal of Constantinople. Early life. Canon of the cathedral chapter of Venice. The Venetian senate recommended to the pope his appointment as dean of the church of Corone on March 23, 1377; occupied the post until 1390. Professor of theology at the University of Bologna. Episcopate. Elected bishop of Castello in October 1380; occupied the post until November 21, 1390. Consecrated (no information found). Legate of Pope Urban VI and apostolic collector in Istria and Dalmatia on February 21, 1387. Named also bishop of of the Island of Negrepont. Promoted to the Latin patriarchate of Constantinople on December 1, 1390. Administrator of the see of Corone, April 20, 1395; retained the post until 1413. Legate of Pope Boniface IX before King Ladislas of Naples in 1399. Named governor of Marche Anconitana on April 4, 1405. Cardinalate. Created cardinal priest of S. Marco in the consistory of June 12, 1405; he kept the administration of the patriarchate until October 23, 1409. On his return from Ancona, he was received by the pope in in a general consistory on September 24, 1406; on the following October 20, the pope finished the ceremonies of his investiture as a cardinal, together with those of Cardinal Giovanni Migliorati. Participated in the conclave of 1406 and was elected pope (1). Papacy. Elected pope on November 30, 1406. Took the name Gregory XII. Crowned, December 19, 1406, patriarchal Vatican basilica, by Cardinal Rinaldo Brancaccio, deacon of Ss. Vito e Modesto (2). He was deposed by the Council of Pisa on July 5, 1409; he did not acknowledge the deposition. He created ten cardinals in two consistories. Resigned the papacy in a letter read by procurator Carlo Malatesta, on July 4, 1415, in the Council of Constance. Cardinalate. The council granted him the title of cardinal bishop of Frascati and the rank immediately after the pope; as well as the legation, for life, of Marche Anconitana. His abdication allowed the end of the Western Schism. Death. October 18, 1417 in Recanati. Buried in the cathedral of Recanati. Bibliography. Cardella, Lorenzo. Memorie storiche de' cardinali della Santa Romana Chiesa. Rome : Stamperia Pagliarini, 1793, III, 324-326; Chacón, Alfonso. Vitæ, et res gestæ Pontificvm Romanorum et S. R. E. Cardinalivm ab initio nascentis Ecclesiæ vsque ad Vrbanvm VIII. Pont. Max. 2 volumes. Romae : Typis Vaticanis, 1630, II, col. 720; Di Sivo, Michele. "Gregorio XII." Mondo vaticano. Passato e presente. Città del Vaticano : Libreria Editrice Vaticana, 1995, p. 580-582; "Essai de liste générale des cardinaux. VI. Les cardinaux du Grand Schisme (1378-1417)". Annuaire Pontifical Catholique 1931. Paris : Maison de la Bonne Presse, 1931, p. 138-139; Eubel, Conradus and Gulik, Guglielmus van. Hierarchia Catholica Medii Aevi. Volumen I (1198-1431). Münich : Sumptibus et Typis Librariae Regensbergianae, 1913; reprint, Padua : Il Messagero di S. Antonio, 1960, pp. 26, 44, 171, 206 and 212; Kelly, John Norman Davidson. The Oxford Dictionary of Popes. Oxford ; New York : Oxford University Press, 1986, pp. 234-236; Ortalli, Gherardo. "Gregorio XII." Enciclopedia dei papi. 3 vols. Roma : Istituto della Enciclopedia italiana, 2000, II, 584-592. Webgraphy. Biography by Michal Ott, in English; The Catholic Encyclopedia; biography, in English, Encyclopaedia Britannica; biography, in Italian; his portrait by Taddeo di Bartolo; his engraving; another engraving, Fondazione Marco Besso, Rome; his effigy, on a medal, Numismatic collection of Olomouc archiepiscopate, Olomouc, Czech Republic; his bust, via Gregorio XII, Recanati, Italy; his arms; and his tomb, cathedral of Recanati. (1) "The fourteen that took part in the conclave swore that, if elected, he would abdicate provided Antipope Benedict XIII did the same or should die; also, that he would not create new cardinals except to maintain parity of members with the Avignon cardinals; and that within three months he would enter into negotiations with his rival about a place of meeting." (Kelly, The Oxford Dictionary of Popes, p. 235). (2) This is according to Onophrio Panvinius Epitome Pontificum Romanorum a S. Petro usque ad Paulum IIII : gestorum (videlicet) electionisque singulorum, & conclauium compendiaria narratio : cardinalium item nomina, dignitatum tituli, insignia legationes, patria & obitus (Venetiis : Impensis Iacobii Stradae Mantuani, 1557), p. 271. Chacón, Vitæ, et res gestæ Pontificvm Romanorum et S. R. E. Cardinalivm, II, cols. 750-751, says that he was crowned by Cardinal Ludovico Fieschi, protodeacon of S. Adriano, who is indicated by the same source as participating in the conclave of 1406. This seems unlikely because Cardinal Fieschi had abandoned the Rome obedience on October 22, 1404, and had joined the obedience of Antipope Benedict XIII on May 11, 1405. Of the three cardinal deacons participating in the conclave, Oddone Colonna of S. Giorgio in Velabro; Pietro Stefaneschi of S. Angelo in Pescheria; and Jean Gilles, of Ss. Cosma e Damiano, Cardinal Colonna was the most senior one and could have crowned the new pope but no information corroborating it has been found. Birth. (No date found), Urbino (or Pisa). His last name is also listed as Ugoccione, Hugotion, Hugociano, Aguzzoni and Aguzzonis. He was called the Cardinal of Bordeaux. Early life. He was a renowned jurisconsult. Episcopate. Named bishop of Faenza by Pope Urban VI in 1378. Consecrated (no information found). Legate in Gascogne, Aragón, Castilla and Navarra in 1382. Promoted to the metropolitan see of Benevento in 1383. Transferred to the metropolitan see of Bordeaux, August 28, 1384. Cardinalate. Created cardinal priest of Ss. Quattro Coronati in the consistory of June 12, 1405; kept the administration of his see until his death. Did not participate in the conclave of 1406, which elected pope Pope Gregory XII. Attended the Council of Pisa. Participated in the conclave of 1409, which elected Antipope Alexander V; and the one of 1410, which elected Antipope John XXIII. Death. July 14, 1412, Florence. Buried in the church of S.Maria Nuova, Rome (1). Bibliography. Cardella, Lorenzo. Memorie storiche de' cardinali della Santa Romana Chiesa. Rome : Stamperia Pagliarini, 1793, III, 334-335; Chacón, Alfonso. Vitæ, et res gestæ Pontificvm Romanorum et S. R. E. Cardinalivm ab initio nascentis Ecclesiæ vsque ad Vrbanvm VIII. Pont. Max. 2 volumes. Romae : Typis Vaticanis, 1630, II, col. 726-727; "Essai de liste générale des cardinaux. VI. Les cardinaux du Grand Schisme (1378-1417)". Annuaire Pontifical Catholique 1931. Paris : Maison de la Bonne Presse, 1931, p.139 ; Eubel, Conradus and Gulik, Guglielmus van. Hierarchia Catholica Medii Aevi. Volumen I (1198-1431). Münich : Sumptibus et Typis Librariae Regensbergianae, 1913; reprint, Padua : Il Messagero di S. Antonio, 1960, pp. 26, 41, 133, 151 and 246; Die Mittelalterlichen Grabmäler in Rom und Latium vom 13. bis zum 15. Jahrhundert. 2 vol. Bearbeitet von Tassilo Blittersdorff ... [et al. ], unter Mitarbeit von Hanns Jäger-Sunstenau und Walter Koch ; redigiert von Jörg Garms, Roswitha Juffinger und Bryan Ward-Perkins. Rom : Verlag der Österreichischen Akademie der Wissenschaften, 1981-1994. (Publikationen des Österreichischen Kulturinstituts in Rom. 2. Abteilung, Quellen ; 5. Reihe; Variation: Publikationen des Österreichischen Kulturinstituts in Rom. ; 2. Abteilung, Quellen ; 5. Reihe). Contents: 1. Bd. Die Grabplatten und Tafeln -- 2. Bd. Die Monumentalgrdber, I, 196-197. Birth. (No date found), Petricoli. Of a noble family. Second son of Senator Giovanni Orsini and Bartolomea Spinelli. The family gave the church several popes and cardinals: Celestine III (1191-1198); Nicholas III (1277-1280); Benedict XIII (1724-1730); Matteo Orsini (1262); Latino Malabranca Orsini, O.P. (1278); Giordano Orsini (1278); Napoleone Orsini (1288); Francesco Napoleone Orsini (1295); Giovanni Gaetano Orsini (1316); Matteo Orsini, O.P. (1327); Rinaldo Orsini (1350); Giacomo Orsini (1371); Poncello Orsini (1378); Tommaso Orsini (1383? ); Latino Orsini (1448); Cosma Orsini, O.S.B. (1480); Giovanni Battista Orsini (1483); Franciotto Orsini (1517); Flavio Orsini (1565); Alessandro Orsini (1615); Virginio Orsini, O.S.Io.Hieros. (1641); and Domenico Orsini d'Aragona (1743). Early life. Auditor of the Sacred Roman Rota. Episcopate. Elected archbishop of Naples before February 13, 1400; occupied the see until his promotion to the cardinalate. Priesthood. Ordained shortly after his promotion to the episcopate. Cardinalate. Created cardinal priest of Ss. Silvestro e Martino ai Monti in the consistory of June 12, 1405. He was named a senator by Pope Innocent VII. Participated in the conclave of 1406, which elected Pope Gregory XII. He was one of the first cardinals to use the right of option when he passed to the title of S. Lorenzo in Damaso, March 25, 1409. Shortly after having participated in the election of Pope Gregory XII, he abandoned his obedience for that of Pisa, where he worked for the union of the church with the pseudocardinals created by Antipope Benedict XIII. Attended the Council of Pisa. Participated in the conclave of 1409, which elected Antipope Alexander V. Administrator of the see of Pécs, September 4, 1409 until August 13, 1410. Participated in the conclave of 1410, which elected Antipope John XXIII. Legate in Spain. Legate in Picenum. Visitor of churches and monasteries in Rome to reestablish the discipline. Opted for the order of cardinal bishops and the suburbicarian see of Albano in June 1412; received the episcopal consecration on September 23, 1412; he kept his title in commendam presumably until his death. Named legate in Bologna, together with Cardinal Ludovico Fieschi, on October 19, 1412; entered the curia in Florence on September 2, 1413. He had a considerable role in the Council of Constance, where he presided the 5th session. Participated in the conclave of 1417, which elected Pope Martin V. Named legate in France, he left Constance on April 2, 1418 with Cardinal Pietro Filargis; their mission was to try to reestablish the peace between the kings of France and England; returned to Florence on March 18, 1419. Named legate in Marche Anconitana. Named grand penitentiary toward 1419. He was absent from the curia from May 23 to September 17, 1421. On January 16, 1426, he was named legate in Hungary and Bohemia; and the following February 17, in Germany to combat the Hussite heresy; he left Rome on March 19; attended the Diet of Nuremberg on May 11. He may have become dean of the Sacred College of Cardinals in 1428 or 1431. Participated in the conclave of 1431, which elected Pope Eugenius IV. Opted for the suburbicarian see of Sabina on March 14, 1431. Named legate to preside the Council of Basle, which opened on July 23, 1431; he defended the rights of the pope. Sent by Pope Eugenius IV to Siena to receive Emperor Sigismund, who was traveling to Rome to be crowned; the coronation took place on May 31, 1433. Archpriest of the patriarchal Vatican basilica, 1434. Resigned the commendam of the Benedictine abbey of Farfa in March 1435. Abbot commendatario of the Cistercian monastery of S. Pastore, diocese of Rieti, until his death. Protector of the Order of the Friars Minor (Franciscans). He was a great friend of the arts and letters, and had a rich collection of books and 254 manuscripts, which he donated to the Vatican basilica. Death. May 29, 1438, Rome. Buried in a chapel that he had built in the patriarchal Vatican basilica. Bibliography. Cardella, Lorenzo. Memorie storiche de' cardinali della Santa Romana Chiesa. Rome : Stamperia Pagliarini, 1793, III, 321-324; Chacón, Alfonso. Vitæ, et res gestæ Pontificvm Romanorum et S. R. E. Cardinalivm ab initio nascentis Ecclesiæ vsque ad Vrbanvm VIII. Pont. Max. 2 volumes. Romae : Typis Vaticanis, 1630, II, col. 719-720; "Essai de liste générale des cardinaux. VI. Les cardinaux du Grand Schisme (1378-1417)". Annuaire Pontifical Catholique 1931. Paris : Maison de la Bonne Presse, 1931, p. 139-140; Eubel, Conradus and Gulik, Guglielmus van. Hierarchia Catholica Medii Aevi. Volumen I (1198-1431). Münich : Sumptibus et Typis Librariae Regensbergianae, 1913; reprint, Padua : Il Messagero di S. Antonio, 1960, pp. 26, 35, 38, 43, 47, 360 and 410; Weber, Christoph and Becker, Michael. Genealogien zur Papstgeschichte. 6 v. Stuttgart : Anton Hiersemann, 1999-2002. (Päpste und Papsttum, Bd. 29, 1-6), VI, 700; Zigarelli, Daniello Maria. Biografie dei vescovi e arcivescovi della chiesa di Napoli con una descrizione del clero, della cattedrale, della basilica di s. Restituta e della cappella del tesoro di s. Gennaro. Napoli: Tipografico di G. Gioja, 1861, pp. 92-93. Webgraphy. Cardinals of the Orsini family by Johann Peter Kirsch, in English, Cardinal Giordano is no. 8, The Catholic Encyclopedia; his arms, Araldica Vaticana. Birth. (No date found), Sulmona. Son of Nicolò Megliorati. Nephew of Pope Innocent VII. His first name is also listed as Giovanni Nicolò. He was called the Cardinal of Ravenna. Education. Obtained a doctorate in canon law and a licentiate in civil law. Episcopate. Elected archbishop of Ravenna, September 15, 1400; he had not yet reached the canonical age; succeeded his uncle the pope. Consecrated (no information found). He introduced the Carmelites in his archdiocese and gave them the church of S. Giovanni Battista. It is said that he never resided in his see. Cardinalate. Created cardinal priest of S. Croce in Gerusalemme in the consistory of June 12, 1405; he kept the administration of his see; he entered the Roman Curia on September 16, 1406 and was received by the pope in public consistory; the pope finished the ceremonies of his investiture as cardinal on October 20, 1406, together with those of Cardinal Angelo Correr. Participated in the conclave of 1406, which elected Pope Gregory XII. Attended the Council of Pisa. Participated in the conclave of 1409, which elected Antipope Alexander V; and in the one of 1410, which elected Antipope John XXIII. Death. October 16, 1410, Bologna. Buried in the cathedral of Ravenna (1). Bibliography. Cardella, Lorenzo. Memorie storiche de' cardinali della Santa Romana Chiesa. Rome : Stamperia Pagliarini, 1793, III, 326; Chacón, Alfonso. Vitæ, et res gestæ Pontificvm Romanorum et S. R. E. Cardinalivm ab initio nascentis Ecclesiæ vsque ad Vrbanvm VIII. Pont. Max. 2 volumes. Romae : Typis Vaticanis, 1630, II, col. 721; "Essai de liste générale des cardinaux. VI. Les cardinaux du Grand Schisme (1378-1417)". Annuaire Pontifical Catholique 1931. Paris : Maison de la Bonne Presse, 1931, p. 140; Eubel, Conradus and Gulik, Guglielmus van. Hierarchia Catholica Medii Aevi. Volumen I (1198-1431). Münich : Sumptibus et Typis Librariae Regensbergianae, 1913; reprint, Padua : Il Messagero di S. Antonio, 1960, pp. 26, 41 and 415. Birth. Ca. 1339, Kare, Crete (then Venetian named Candia). Of a very poor family, he was orphaned; he was sheltered and taught by a Franciscan friar. His last name is also listed as Filargo, Philargis, Philarghi, Philaretus, Philarete and Philargos. He is also listed as Pietro di Candia and Petrus de Candia. Called the Cardinal of Milan. Education. Entered the Order of the Friars Minor (Franciscans) at the convent of Candia, ca. 1357. Studied at Padua, Norwich and Oxford University, where he obtained a licentiate in theology; and at La Sorbonne University, Paris, where he obtained a doctorate in theology in 1381. Magister in theology. Priesthood. Ordained (no further information found). He taught at Franciscan houses of study in Russia, Bohemia and Poland. He lecture on the "Sentences" of Peter Abelardo in Paris, 1378-1380. Professor of theology at the University of Pavia from 1386. Protégé and privy counselor of Gian Galeazzo Visconti. Episcopate. Elected bishop of Piacenza, October 5, 1386. Transferred to the see of Brescia in 1387 (1). Transferred to the see of Vicenza on January 23, 1388. Transferred to the see of Novara, September 18, 1389 (2). In 1395, he carried out a diplomatic mission for his patron that obtained for the latter the title of duke of Milan from German King Wenceslas. Promoted to the metropolitan see of Milan, May 17, 1402. Ambassador of the duke of Milan in Bohemia. Cardinalate. Created cardinal priest of Ss. XII Apostoli in the consistory of June 12, 1405; he retained the administration of his see of Milan. Named legate in Lombardy; he left Viterbo on November 23, 1406. Impatient with Pope Gregory XII for delaying the end of the schism, he broke up with the pope in May 1408 and collaborated with Cardinal Baldassare Cossa, future Antipope John XXIII, in convoking the Council of Pisa. Deprived of the administration of Milan by Pope Gregory XII in November 1408. Participated in the conclave of 1409 and was elected antipope. Papacy. Elected Antipope Alexander V on June 26, 1409 at the Council of Pisa, in the archbishop's palace; after the deposition of Pope Gregory XII and Antipope Benedict XIII by the council. Took the name Alexander V. Crowned on July 7, 1409, at the cathedral of Pisa, by Cardinal Amedeo Saluzzo, protodeacon of S. Maria Nuova. He did not create any cardinals. Death. May 3, 1410, in the palace of Cardinal Baldassare Cossa, in Bologna; some sources, probably falsely, indicate that he was poisoned by order of the cardinal. His body was embalmed by the famous physician Pietro di Argeleta; the verbal process of the operation is still preserved. Buried in the church of S. Francesco, Bologna. At his death, Cardinal Egidio de Viterbo wrote: Pauperibus levandis ita studuit ut nihil omnino sibi reservaret. Bibliography. Cardella, Lorenzo. Memorie storiche de' cardinali della Santa Romana Chiesa. Rome : Stamperia Pagliarini, 1793, III, 326-329; Cazzani, Eugenio. Vescovi e arcivescovi di Milano. Nuova ed./ a cura di Angelo Majo, 2. ed. Milano : Massimo : NED, 1996. Note: Originally published 1955, now enlarged and updated, p. 197-200; Chacón, Alfonso. Vitæ, et res gestæ Pontificvm Romanorum et S. R. E. Cardinalivm ab initio nascentis Ecclesiæ vsque ad Vrbanvm VIII. Pont. Max. 2 volumes. Romae : Typis Vaticanis, 1630, II, col. 721-722 and 773-784; "Essai de liste générale des cardinaux. VI. Les cardinaux du Grand Schisme (1378-1417)". Annuaire Pontifical Catholique 1931. Paris : Maison de la Bonne Presse, 1931, p. 140; Eubel, Conradus and Gulik, Guglielmus van. Hierarchia Catholica Medii Aevi. Volumen I (1198-1431). Münich : Sumptibus et Typis Librariae Regensbergianae, 1913; reprint, Padua : Il Messagero di S. Antonio, 1960, pp. 26, 40, 147, 333, 372, 401 and 526; Gams, Pius Bonifatius. Series episcoporum Ecclesiae catholicae. 3 v. in 1. Graz : Akademische Druck- u. Verlagsanstalt, 1957, p. 746, 796, 807 and 820; Ilari, Annibale. "Alessandro V." Mondo vaticano. Passato e presente. Città del Vaticano : Libreria Editrice Vaticana, 1995, p., 44-45; Kelly, John Norman Davidson. The Oxford Dictionary of Popes. Oxford ; New York : Oxford University Press, 1986, pp. 326-327; Majo, Angelo. Storia della chiesa ambrosiana. 5 vols. 2nd ed. Milano : NED, 1983-1986, II, 95, 102-104 and 121; Orsoni, Alessandro. Cronologia storica dei vescovi Olivolensi detti dapoi Castellani e sucessivi patriarchi di Venezia. Corredata di annotazioni illustranti l'ecclesiastico-civile veneta storia. Venezia : Tip. G.S. Felice, 1828, p. 241; Petrucci, Armando. "Alessandro V." Enciclopedia dei papi. 3 vols. Roma : Istituto della Enciclopedia italiana, 2000, II, 610-613. Webgraphy. Biography by John Bertram Peterson, in English, The Catholic Encyclopedia; biography, in English, Encyclopaedia Britannica; biography by Armando Petrucci, in Italian, Dizionario Biografico degli Italiani - Volume 2 (1960), Treccani; his image and biography, in English; his engraving, arms and biography, in Italian Wikipedia; biographical entry, in Italian; biography and bibliography, in English; and his engraving, Fondazione Marco Besso, Rome; Serie cronologica dei vescovi di Milano (III-XXI secolo), in Italian, archdiocese of Milan. (1) This is according to Gams, Series episcoporum Ecclesiae catholicae, p. 780. None of the other sources consulted list him as bishop of Brescia. His biography in Italian by Petrucci, linked above, specifically says that he was never bishop of Brescia. (2) Orsoni, Cronologia storica dei vescovi Olivolensi detti dapoi Castellani e sucessivi patriarchi di Venezia, p. 241, says that he was also archbishop of Ravenna and patriarch of Grado. None of the other sources consulted mention him as occupant of those sees. His biography in Italian by Petrucci, linked above, specifically says that he was never patriarch of Grado. Birth. (No date found), Rome. His last name is also listed as Archeoni. He was called the Cardinal of Ascoli. Early life. Vicar general of Montecassino. Episcopate. Elected bishop of Aquino in 1380. Consecrated (no information found). Transferred to the see of Ascoli Piceno, February 6, 1387. Transferred to the see of Arezzo, October 10, 1390; occupied the see of a year. Named bishop of Ascoli Piceno, again, in 1399; celebrated a synod; occupied the see until his promotion to the cardinalate. Name vicar of the pope for Rome in 1400. Cardinalate. Created cardinal priest of S. Pietro in Vincoli in the consistory of June 12, 1405. Death. July 21 (or 26), 1405 (1), Rome. Buried near the altar dedicated to S. Girolamo in the patriarchal Liberian basilica (2). Bibliography. Cardella, Lorenzo. Memorie storiche de' cardinali della Santa Romana Chiesa. Rome : Stamperia Pagliarini, 1793, III, 330; Chacón, Alfonso. Vitæ, et res gestæ Pontificvm Romanorum et S. R. E. Cardinalivm ab initio nascentis Ecclesiæ vsque ad Vrbanvm VIII. Pont. Max. 2 volumes. Romae : Typis Vaticanis, 1630, II, col. 722-723; "Essai de liste générale des cardinaux. VI. Les cardinaux du Grand Schisme (1378-1417)". Annuaire Pontifical Catholique 1931. Paris : Maison de la Bonne Presse, 1931, p. 140; Eubel, Conradus and Gulik, Guglielmus van. Hierarchia Catholica Medii Aevi. Volumen I (1198-1431). Münich : Sumptibus et Typis Librariae Regensbergianae, 1913; reprint, Padua : Il Messagero di S. Antonio, 1960, pp. 26, 45, 100, 104 and 111. (1) Eubel, Hierarchia Catholica Medii Aevi, I, 26, gives this date and adds: "non June. 12"; "Essai de liste générale des cardinaux. VI. Les cardinaux du Grand Schisme (1378-1417)". Annuaire Pontifical Catholique 1931, p. 140, says he died on July 21 or 26, 1405; Chacón, Alfonso. Vitæ, et res gestæ Pontificvm Romanorum et S. R. E. Cardinalivm, II, col. 723, says that he died on July 26, 1405. Early life. Sindico of the officers of the senate. Consistorial lawyer. Canon of the patriarchal Vatican basilica. Episcopate. Elected bishop of Imola, October 10, 1390; took possession on October 21, 1390. Consecrated after June 1391. Transferred to the see of Todi, December 22, 1395; occupied the see until his promotion to the cardinalate. Cardinalate. Created cardinal priest of S. Prassede in the consistory of June 12, 1405. Participated in the conclave of 1406, which elected Pope Gregory XII. Shortly after, he abandoned the obedience of Rome for that of Pisa, where he worked for the union of the church with the pseudocardinals created by Antipope Benedict XIII. Archpriest of the patriarchal Vatican basilica from 1408 until his death. Participated in the conclave of 1409, which elected Antipope Alexander V. Opted for the title of S. Marco, July 2, 1409. Participated in the conclave of 1410, which elected Antipope John XXIII. Death. October 2, 1411, Rome. Buried in a chapel that he had built in the patriarchal Vatican basilica. Bibliography. Cardella, Lorenzo. Memorie storiche de' cardinali della Santa Romana Chiesa. Rome : Stamperia Pagliarini, 1793, III, 329-330; Chacón, Alfonso. Vitæ, et res gestæ Pontificvm Romanorum et S. R. E. Cardinalivm ab initio nascentis Ecclesiæ vsque ad Vrbanvm VIII. Pont. Max. 2 volumes. Romae : Typis Vaticanis, 1630, II, col.722 ; "Essai de liste générale des cardinaux. VI. Les cardinaux du Grand Schisme (1378-1417)". Annuaire Pontifical Catholique 1931. Paris : Maison de la Bonne Presse, 1931, p. 140-141; Eubel, Conradus and Gulik, Guglielmus van. Hierarchia Catholica Medii Aevi. Volumen I (1198-1431). Münich : Sumptibus et Typis Librariae Regensbergianae, 1913; reprint, Padua : Il Messagero di S. Antonio, 1960, pp. 26, 44, 45, 284 and 502. Birth. 1368, Genazzano, Campagna di Roma. Son of Agapito Colona, signore of Genazzano, Capranica Palestrina, San Vito e Ciciliano, and Caterina Conti, of the signori of Valmontone. His first name is also listed as Oddo; as Odone; as Otto; and as Ottone. Uncle of Cardinal Prospero Colonna (1426). Grand uncle of Cardinal Giovanni Colonna (1480). Other cardinals from the different branches of the family were Giovanni Colonna (1212); Giacomo Colonna (1278); Pietro Colonna (1288); Giovanni Colonna (1327); Agapito Colonna (1378); Stefano Colonna (1378); Pompeo Colonna (1517); Marco Antonio Colonna, seniore (1565); Ascanio Colonna (1586); Girolamo Colonna (1627); Carlo Colonna (1706); Prospero Colonna (1739); Girolamo Colonna (1743); Prospero Colonna (1743); Marcantonio Colonna, iuniore (1759); Pietro Colonna (1766), who took the last name Pamphili; and Nicola Colonna, 1785. He was called the Cardinal Colonna. Education. Studied law at the University of Pavia. Early life. Referendary and protonotary apostolic in the pontificate of Pope Urban VI. Named auditor of the Sacred Roman Rota and apostolic nuncio in Italy by Pope Boniface IX. Episcopate. Elected bishop of Urbino in 1380; occupied the see until 1409; he never received the episcopal consecration until his election to the papacy. Administrator of the suburbicarian see of Palestrina, December 15, 1401 until 1405. Cardinalate. Created cardinal deacon of S. Giorgio in Velabro in the consistory of June 12, 1405. Participated in the conclave of 1406, which elected Pope Gregory XII. In the summer of 1408, he abandoned the obedience of Pope Gregory XII and was active in the preparation of the Council of Pisa; he worked for the union of the church with the pseudocardinals created by Antipope Benedict XIII. Attended the Council of Pisa. Participated in the conclave of 1409, which elected Antipope Alexander V. Participated in the conclave of 1410, which elected Antipope John XXIII. Attended in the Council of Constance. Entered the Roman Curia on June 12, 1412. Legate Umbria in 1411. Vicar of Rome and archpriest of the patriarchal Lateran basilica in 1412. Legate in the province of the Patrimony, the duchy of Spoleto and in Perugia, Todi, Terni and Amelia in 1413. Legate in Toscany. He remained loyal to Antipope John XXIII until the latter's flight from Constance. Participated in the conclave of 1417 and was elected pope. Papacy. Elected pope on November 11, 1417. Took the name Martin V. Ordained to the priesthood on Saturday November 13, 1417, in the presbyterium of the cathedral of Constance, by Cardinal Jean Allarmet de Brogny, bishop of Ostia and Velletri, dean of the Sacred College of Cardinals. Consecrated bishop on Sunday November 14, 1417, in the same presbyterium, also by Cardinal Allarmet de Brogny. 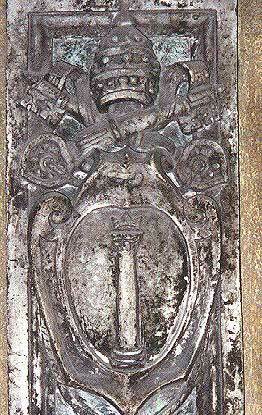 Crowned, November 21, 1417, in front of the cathedral of Constance, by Cardinal Rinaldo Brancaccio, protodeacon of Ss. Vito e Modesto. He presided over the last session of the Council of Constance, which ended on April 22, 1418. He created seventeen cardinals in four consistories. Death. February 20, 1431, Rome. Buried in the middle of the nave of the patriarchal Lateran basilica, Rome (1); in 1853, his tomb was transferred to the area of the Confession of the basilica. -Weber, Christoph and Becker, Michael. Genealogien zur Papstgeschichte. 6 v. Stuttgart : Anton Hiersemann, 1999-2002. (Päpste und Papsttum, Bd. 29, 1-6), V, 240. Webgraphy. Biography by Concetta Bianca, in Italian, Dizionario Biografico degli Italiani - Volume 71 (2008), Treccani; biography by Michael Ott, in English, The Catholic Encyclopedia; his portrait in bronze and biography, in English, Encyclopaedia Britannica; biography by Ansgar Frenken, in German, Biographisch-Bibliographischen Kirchenlexikons; his portrait, secolo XVI (1590-1610), ambito romano, regione ecclesiastica Lazio, diocesi Palestrina, Beni Ecclesiastici in web (BeWeB); his engraving, by Bernard Picart (incisore), secolo XVIII (1713), ambito francese, regione ecclesiastica Triveneto, diocesi Trento, Beni Ecclesiastici in web (BeWeB); his statue by Jacopino a Tradate, cathedral of Milan, Web Gallery of Art; his effigy on a medal, Christopher Eimer; his arms, patriarchal Lateran basilica, Rome, Rome Art Lover; his arms, secolo XV (1417-1430), bottega italiana, regione ecclesiastica Lazio, diocesi Viterbo, Beni Ecclesiastici in web (BeWeB); engravings and arms, Araldica Vaticana; San Bernardino presenta la regola a Martino V by Giovanni Laurentini, l'Arrigoni, ambito romagnolo, regione ecclesiastica Emilia Romagna, diocesi Rimini, Beni Ecclesiastici in web (BeWeB); his arms and tomb, Requiem Datenbank; his jascent statue on his tomb, Rome Art Lover; The Colonna family by James Loughlin, in English, The Catholic Encyclopedia; Come finì lo scisma d’Occidente by Agostino Paravicini Bagliani, L'Osservatore Romano, 10 novembre 2017; La questione del primato. Sei secoli fa durante il concilio di Costanza veniva eletto Martino V by Kurt Koch, L'Osservatore Romano, 11 novembre 2017. Birth. (No date found), Trastevere, Rome. Of the signori of Molara. Son of Annibale Stefaneschi. His last name is also listed as Stefaneschi Annibaldi; as Stephaneschi; as Stephanescis; and as Stephani. He was called the Cardinal of Rome or of S. Angelo. Early life. Named by Pope Boniface IX acolyte of the papal chapel at the end of his adolescence. Protonotary apostolic. Cardinalate. Created cardinal deacon of S. Angelo in Pescheria in the consistory of June 12, 1405. Participated in the conclave of 1406, which elected Pope Gregory XII. Vicar of Rome during the absence of Pope Gregory XII with a subsidy of 500 scudi per month. Attended the Council of Pisa. Participated in the conclave of 1409, which elected Antipope Alexander V. Opted for the deaconry of Ss. Cosma e Damiano, July 2, 1409. Participated in the conclave of 1410, which elected Antipope John XXIII. Opted for the deaconry of S. Angelo in Pescheria, again, in 1410. Legate a latere in Naples, November 25, 1413. Vicar of Rome, for the spiritual and temporal affairs, and legate a latere, of Antipope John XXIII at the time of the Council of Constance; he had a subsidy of 400 scudi per month. Episcopate. Administrator of the see of Nebbio, March 20, 1415. Death. October 30, 1417 Rome. Buried in the church of S. Maria in Trastevere, Rome (1). Bibliography. Cardella, Lorenzo. Memorie storiche de' cardinali della Santa Romana Chiesa. Rome : Stamperia Pagliarini, 1793, III, 330-332; Chacón, Alfonso. Vitæ, et res gestæ Pontificvm Romanorum et S. R. E. Cardinalivm ab initio nascentis Ecclesiæ vsque ad Vrbanvm VIII. Pont. Max. 2 volumes. Romae : Typis Vaticanis, 1677, II, col. 723-724; De Benedictis, Cristina ; Stefaneschi, Pietro ; Vannini, Sebastiano. "La vita del cardinale Pietro Stefaneschi". Annali della scuola normale superiore di Pisa, Classe di lettere e filosofia:, serie III, vol. 6, 3, 1976, pp. 955-1016; "Essai de liste générale des cardinaux. VI. Les cardinaux du Grand Schisme (1378-1417)". Annuaire Pontifical Catholique 1931. Paris : Maison de la Bonne Presse, 1931, p. 141; Eubel, Conradus and Gulik, Guglielmus van. Hierarchia Catholica Medii Aevi. Volumen I (1198-1431). Münich : Sumptibus et Typis Librariae Regensbergianae, 1913; reprint, Padua : Il Messagero di S. Antonio, 1960, pp. 23, 49 and 360. Webgraphy. His tomb and biography, in Italian, Wikipedia; his arms, Araldica Vaticana; his tomb, church of S. Maria in Trastevere, Rome, The Australian National University; his tomb, patriarchal Lateran basilica, Rome, Requiem Datenbak. Ossa terit tellus, animæ stat gloria Coelo. MAGISTER PAVLVS FECIT HOC OPVS. Birth. (No date found), Normandy. His last name is also listed as Gile and Egidi. He was called the Cardinal of Liège. Early life. Canon chantre of the cathedral chapter of Paris. Pope Urban VI named him auditor of the Sacred Roman Rota and apostolic chaplain. Provost of Liège in 1390. Papal legate in the dioceses of Cologne, Trier and Reims; he was confirmed in this post by Pope Boniface IX..
Cardinalate. Created cardinal deacon of S. Cosma e Damiano in the consistory of June 12, 1405. He entered the papal curia in Viterbo on December 12, 1405; the pope finished the ceremonies of his investiture as a cardinal on January 12, 1406. Participated in the conclave of 1406, which elected Pope Gregory XII. 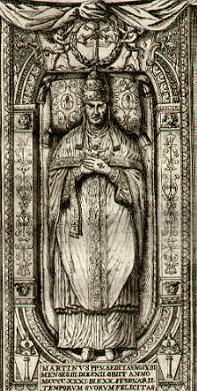 He announced the election of Pope Gregory XII at the University of Paris on December 17, 1406 and indicated the good will of the elected for the termination of the schism; later, because of the pope's resistance, he abandoned his obedience for that of Pisa, where he worked for the union of the church with the pseudocardinals created by Antipope Benedict XIII. Death. July 1, 1408, Pisa. On March 15, 1410, Antipope Alexander V issued a safe conduct to three of his relatives to transport his body to Liège, where it was buried in the cathedral. Bibliography. Cardella, Lorenzo. Memorie storiche de' cardinali della Santa Romana Chiesa. Rome : Stamperia Pagliarini, 1793, III, 333-334; Chacón, Alfonso. Vitæ, et res gestæ Pontificvm Romanorum et S. R. E. Cardinalivm ab initio nascentis Ecclesiæ vsque ad Vrbanvm VIII. Pont. Max. 2 volumes. Romae : Typis Vaticanis, 1630, II, col. 725-726; "Essai de liste générale des cardinaux. VI. Les cardinaux du Grand Schisme (1378-1417)". Annuaire Pontifical Catholique 1931. Paris : Maison de la Bonne Presse, 1931, p. 141; Eubel, Conradus and Gulik, Guglielmus van. Hierarchia Catholica Medii Aevi. Volumen I (1198-1431). Münich : Sumptibus et Typis Librariae Regensbergianae, 1913; reprint, Padua : Il Messagero di S. Antonio, 1960, pp. 27 and 49.